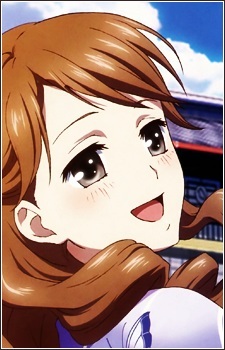 Yuina is a 16-year-old teenager who is daughter of the Fukuya Inn owners that are rivals with Kissuisō. While a rivalry exists between Yuina's and Ohana's grandmothers, she remains friendly towards Ohana. Unlike Ohana, Yuina doesn't seem particularly interested in the affairs of the inn. She attends the same high school as Ohana, Minko and Nako. Yuina has a strange habit of observing and using foreign dialects, often switching which dialect she uses. While Yuina is the class heart throb (along with Minko), she turns down every love confession. It is revealed that Yuina has a fiancé, Yosuke, who is not only her childhood friend but also a manager at another hot spring inn. Yosuke wants Yuina to work alongside him at the inn, but she refuses, saying that she doesn't like working at an inn. Later she helps out, as Yosuke's inn is short on people. Yuina mentions that this is her first time doing actual work and that it wasn't so bad.